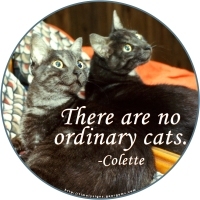 As Colette astutely observed, “There are no ordinary cats.” We could have used countless pictures to illustrate this point, as we have seen it proven time and time again. Out of all of them, we have chosen this portrait of one of our well-loved grey ladies (who lived to be 20 and whom we still miss dearly) perched in one of her favorite spots in front of my dresser mirror. Framed in a circle, this picture and quote will be sure to please the most purr-snickety cat lover on your list. Buy this design today on a shirt, mug, tote bag, clock or other quality giftware or apparel item.